New Year’s Eve 2018 will wrap up a year of celebrations for Canada’s 150th anniversary of Confederation. 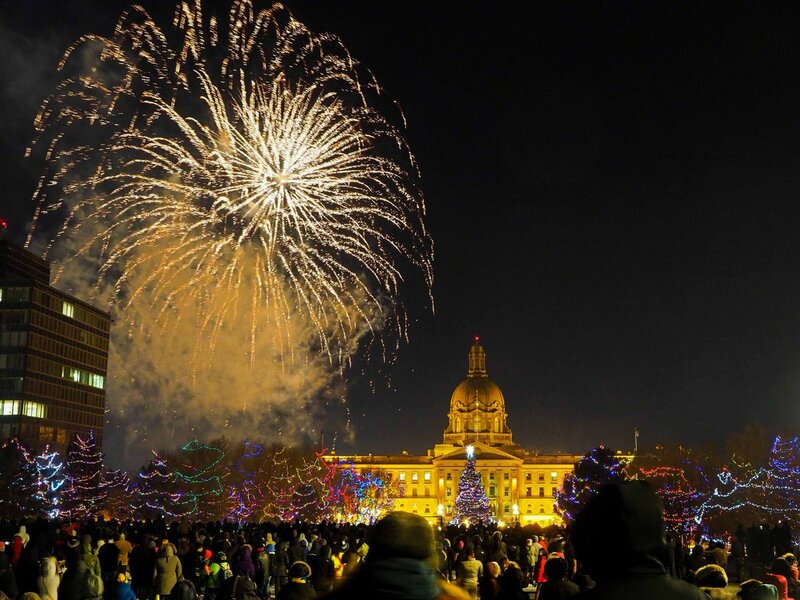 The New Year’s Eve Downtown celebration and fireworks show is moving to the Alberta Legislature Grounds. The free, family-friendly New Year’s Eve celebrations will take place from 6-9pm, culminating with a fireworks show at 9pm. More program and event details to come closer to the event date. If no fireworks at midnight then I ain't gonna bother going. I'd sooner just go to a club or something. Why at 9.00, did they say? Too early. Last year they did 9pm and midnight due to 150 funding, but this year they had budgets for 1 show and due to it being on the Leg grounds, it was determined that a family friendly 9pm would be the choice. I was/am not pleased, however this is hopefully temporary. Considering all the other 8/830 fireworks in the burbs doing 9pm downtown makes no sense. Should be midnight. Incredibly dumb. Even more incredibly lame excuse - "oh, there are people living nearby." Silly Hall bureaucrats - must be the same people who broughht us the Metro line. But isn't downtown wanting to be more "family friendly?" It said on CHED they wanted to get people from the Oilers game letting out at 8:00 to go over to the Legislature for fireworks. I could see that logic if the fireworks were going to be at city hall, but I don't think the planners get how far it is from Roger's to the Legislature grounds. It's 32 minutes on foot, and that's for a healthy adult walking at speed. A family would take closer to the whole hour. How many people are actually going to do that? And I can't see many people from the outer marches heading into core for just fireworks, either. They should have stuck with midnight proper. This has to do with multiple factors and to be very clear, we are not apart of this decision or workings. I will be working to ensure it comes back to midnight and perhaps if possible both a 9/12 show when it returns to Churchill. And being at the Leg will give folks along the river and on the south side of the river a better view. People are up watching the fireworks from their balconies etc at midnight. I know we did, and many surrounding us did...so this consideration for neighbours is bs. Global poll said 72% said it was way too early. That would be inane if that's one of the reasons. The mode DT continues to be leave entertainment, drive home. Whether its Rogers, Citadel, Winspear, etc. As much as I like winter a lot of people don't and a lot of people don't like walking around in winter. This year especially bad for slippery sidewalks and intersections. The irony of investing countless millions in Catalysts to get people engaged in the DT and going DT and then the city can't afford a standard family plus midnight two times NYE fireworks displays that a lot of cities have. is silly hall possibly this stupid? Rhetorical question. Yeah, the king Midas of *****. Due to cold weather, the outdoor activities for New Year's Eve have been cancelled. Fireworks will continue but online viewing on the City's Facebook page is encouraged. Indoor activities will continue from 6-9 pm in Federal Building and pedway. "just go to a club"? I wish I was so wealthy, I hate the way clubs in Canada charge a fortune in door charges for NYE "parties". Bah humbug, I've learned to choose a friend having a house party. So you hate capitalism? The law of supply and demand applies. They can charge as much as they please and you can choose whether you can afford it or not. Unless you think clubs should be socialist haunts with no cover charge, all drinks at controlled prices and standardized attire. Actually its not even sound capitalism. Its attempts at cash grabs. Was just talking to a manager at Fantasyland Hotel yesterday. He stated that their NYE Celebrations have always gone off without a hitch but several around the city end up cancelling and refunding every year because they don't get enough to have the event. The Mac even cancelled their NYE last year due to only selling 18 tickets at the exorbitant price. This year they've only sold 80. People in the present economy are just not digging down deep for this excess. Meanwhile places that charge a minimum, say 20 bucks for just a place to pack in on NYE and party with other people pack them in and sell copious drinks, champagne all night. So actually the capitalists charge less, to make more. The fatcats try to empty pockets at door charge tickets and end up failing. lol that they have cancelled the outdoor festivities. Do they think we're snowflakes. Or Is this stringy Iveson one. I imagine he can't step outside for 5mins in this weather. We've been out for long periods walking, snowshoeing, doing activities, every day throughout this "Cold streak". What a bunch of lilly livers, since when do we cancel things in Edmonton because of cold. Deep Freeze, Silver Skate, and Flying Canoe are typically this cold. We're trying to build an acceptance of winter, a love of winter, an embracing of it and showing that we can have lots of fun outdoors in winter and yet we are cancelling outdoor events, during a typical winter front. lmao at the inconsistency. I mostly agree. It’s edmonton, it’s winter and it’s been this cold many, many times before. We have the coats and boots and infrastructure to handle far far colder weather. In the 1880s is was -40, -45 and people survived - and stayed here to build lives. Yet -20 now causes panic and a rush to book flights to Hawaii. Pitiful. Makes me wonder: are our broadcasters all kind whimpy guys now? Go to the gym but can’t handle a sprinkle of rain or a simple winter flurry without feeling the need to issue endless warnings? Or maybe it’s the population balance of people new to Alberta from warm climates that are somehow driving a redefinition of what is cool and cold to any temperature below +20 degrees. Last edited by KC; 31-12-2017 at 11:24 AM. I mostly agree. It’s edmonton, it’s winter and it’s been this cold many, many times before. The media seem to love the hyperbole but everyone else should just roll their eyes. Snowmagedons etc. Sure it is weird. This is Edmonton, we live here. Frankly I can't remember one Flying Canoe festival I have attended that wasn't colder than -20 even not factoring in windchill. Invariably it is given that its a night time, not daytime event. They don't cancel, thank gawd, and its a fantastic event and relative cold just adds to the atmosphere of it. Same with the night installations and performances at Deep Freeze, and Silver Skate. Any cold just adds to the event, it makes us feel part of winter. Just accept it. Shake hands with it. Man remember the first night celebrations where the whole point was the outdoor performance, which lasted around an hour and then fireworks? Nowadays people need insulated tents for ice fishing, for work (unions now demanding that worksites that are outdoors have heated insulated tents at hand) and for play. With just cancelling the play..This has even infected ski hills now. Since when is -24 considered too cold to operate ski hills? This is the climate here, get used to it, know how to dress in it and its bugger all to contend with. Its easier to adapt to temps considered too cold than temps considered too hot. Every walk I've had this week the only consideration, ever, is that I might be getting too warm. After an hour of walking your body develops potentially too much heat. I don't have the highest end breathable fabrics. So all I have to do is slow down once in a while just a bit. Don't want to start sweating. I'm nearly 60 and I snowshoe regularly and occasionally cross country ski in this weather. Used to skate in this weather. Its not cold, its just being dressed somewhat appropriately. I'll be out today again doing a bit of snowshoeing, sight seeing, followed by a long dip in the outside hot tub. I'll love every minute of it thinking this couldn't be better. I'll love it even more for the quiet and solitude and wonder of it. Last edited by Replacement; 31-12-2017 at 11:32 AM. Pro (layman) tips. Keep the head warm. Keep the torso warm, and have proper mitts and reasonably appropriate footwear or lacking that at least good socks. This doesn't need to be expensive either. Just wear mitts, not fingered gloves when it gets cold. Basically any insulated mitt that keeps your fingers together will work. Next have a toque that is double layered. This makes so much difference. Most people out there have thin knit fashion toques on. The wind goes right through that stuff. Try a toque with an inner lining sometime. You'll wonder how you lived without it. Mad Hatter at MWTC has cheap Chinese versions of double layered toques on sale for 6 bucks. Go out and get one. You'll love it. Good bye head getting cold. your head will never get cold again. If fashion isn't your thing, and just being warm is go check out Army and Navy. All you need at reasonable prices. With torso and legs remember thin layering. Marks sells pants that have an inner layer. Again makes all the difference. If you don't want to shell out for thermal insulated pants just wear long johns or tights on underneath your regular pants. Nobody will know. They could even have pictures of spider man on.. Torso, same thing. Undershirt, top shirt, and lined parka with shell and inner layer. Some degree of breathability being far superior. I often just wear a vest instead as then the arms off heat fine. If buying a vest make sure its one where the neck goes way up providing neck protection and eliminating need for a scarf. If you don't like cold air wear a scarf or tunic over your nose and mouth and the air you are breathing will feel warm. Pay attention to signals. Be careful out there, but enjoy the winter properly dressed for it. These are just layman suggestions. Others will have more specific information. I'm thinking that longtime winter goers should be sharing information maybe. Last edited by Replacement; 31-12-2017 at 11:51 AM. NYE in Sherwood Park was awesome as usual and better fireworks than I see when I go to the Edmonton version. Also free hot chocolate, free coffee, gifts, lights etc. Try that sometime Edmonton. Last time I went to Edmontons DT celly Hot Chocolate and coffee were being sold for 3.50. Also no encounters with drunk idiots, no unpleasant people around and nothing but a pleasure throughout. The Park does this up right every year. Thousands in attendance even with the cold. lol that there was a steady stream of traffic out of the Park back to Edmonton after. 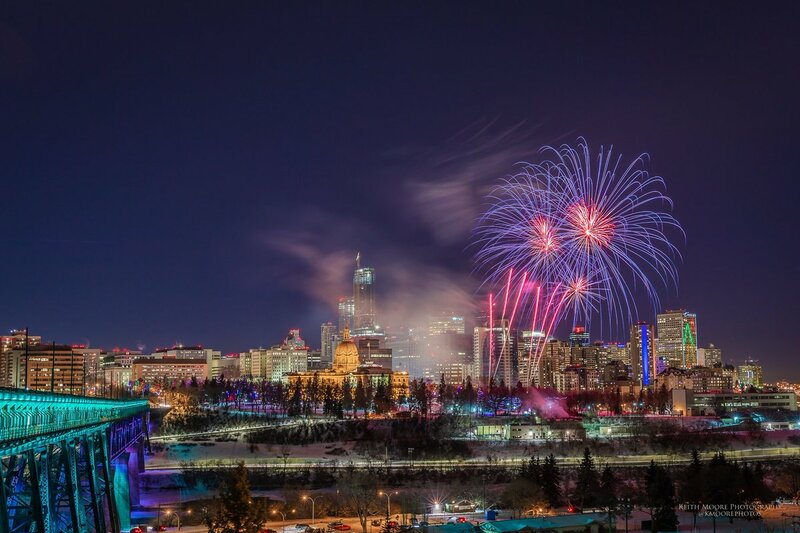 I wonder how many Edmontonians similarly go to the Park NYE. Have done it a couple times. It’s nice. NYE St Albert was lovely, I'm surprised the fireworks went on, as long as they did, beautiful! I heard Edmonton's were nice, I missed them online..
Just to mention that the Calgary fireworks were featured prominently in the Canadian coverage. Not one national Network showed the Edmonton fireworks or even featured Edmonton from what I saw. Aren't things like this considered exposure, and important. This City spends any amount trying to get exposure but a minimal cost thing like a civic NYE fireworks display always gets shorted. Calgary as usual we're setting fireworks off at the top of the tower as well as Olympic Village. lol that they didn't even film it in high resolution when they actually suggested that's how people should watch the fireworks last night given the weather. Edmontons message to Edmontonians was essentially "Its cold, stay home, we're cancelling all outdoor festivities, watch it streaming live instead, then provide a ****** stream. One other comment. Sherwood Park are doing a redo of all the planned outdoor festivities on Jan 3, as it will be warmer and inviting people to come out for a second round of play and enjoyment. might even go again. Of course Edmonton just cancels, screw everything, and doesn't reschedule any of it. Performers get paid, without performing. Nice gig. IanO will be along at some point saying it was the best NYE celebration ever, that it was stupendous and everybody missed out and that great food truck cuisine was all over the place. I bet there was more people just at Bourbon Street in WEM celebrating NYE than there was at the Leg. Not even counting 600 other revellers at Fantasyland. We bundled up and went to the fireworks. Extremely cold. We got there about 8:50. The crowd was small but the fireworks were pretty good. It was worth the walk. Just watched the fireworks online at City of Edmonton. Lol that they didn't even position the camera properly or focus it and it is very low definition. What a joke the streaming of it is. Does the city exhibit this degree of incompetence on purpose? Is communication so bad within the city that the Film crew they send out doesn't know the actual location of the fireworks and where to setup. Half or more of the fireworks display was blocked by the ugly annex building. The fireworks also being less impressive than the one that even Sherwood Park put on. Typically half assed COE NYE effort. No wonder people go elsewhere. This whole fiasco is a perfect storm of the namby pamby safety-first culture that permeates everything these days combined with the whole "families first to hell with everybody else" ethos, the same ethos that says it's illegal to even have adults-only condos in this province. Edmonton needs to get past this juvenile attitude. I know, right? BS...that's why we moved. Actually, you are incorrect. Crowds were actually quite large given the weather and reduced programming. The video feed was unfortunately placed and it is a shame about the weather, but the fireworks were actually quite good. Great shot of the night. Heh, shades of Deadmonton. Hard to shake, eh? Any word on whether the outdoor activities and fireworks are a go at temps or not. Seems to have been a lot of confusion on that over last week and whether the -25 cancellation is ambient Temperature or Windchill Temp. Even news casts were confused on that point. Windchill is supposed to be around -22 this evening. Close. Is this a confirmed go so people can know? I certainly hope that the fireworks can revert to midnight once the LRT construction is complete at Churchill Square. Its -8. I recall going to WCS and it was -25. Hardy no more.. I'll go to outdoor NYE in literally any temp. Cold doesn't really effect me with proper clothing. Last year the outdorr festivities were CANCELLED due to it being a bit colder. We went to Sherwood Park instead where they had lots on. I was just enquiring if its on this year with the -22 forecast. Thanks Ian for the affirmative on that. Last edited by Replacement; 31-12-2018 at 04:24 PM. St Albert's fireworks were great, 15 minutes worth! Home to see NewYork usher in 2019..
Great photos, fireworks look like they were good. Great photos, wrong time of the night. Ended up ringing in the New Year at Central Social Hall. The photos reveal a bit of a secret that South side, Saskatchewan Drive and Kinsmen are possibly better viewing points, more easily assessed, etc. Much better for picture taking as well. Uses the skyline as backdrop. heh, for some reason I kind of forgot about that. Next time if its at the Leg I'll just go southside to see the fireworks. Less crowds. Just park the car, get out, watch the fireworks, beat traffic home. And be in bed by 10. Fireworks at 9 pm is fine for most occasions but New Year's eve is a countdown to a specific time. Holding the main display at any time other than midnight is lame. If people want to take their kids to a display, attend one in a different part of town. Last edited by kkozoriz; 01-01-2019 at 03:20 PM. Lets also be candid. 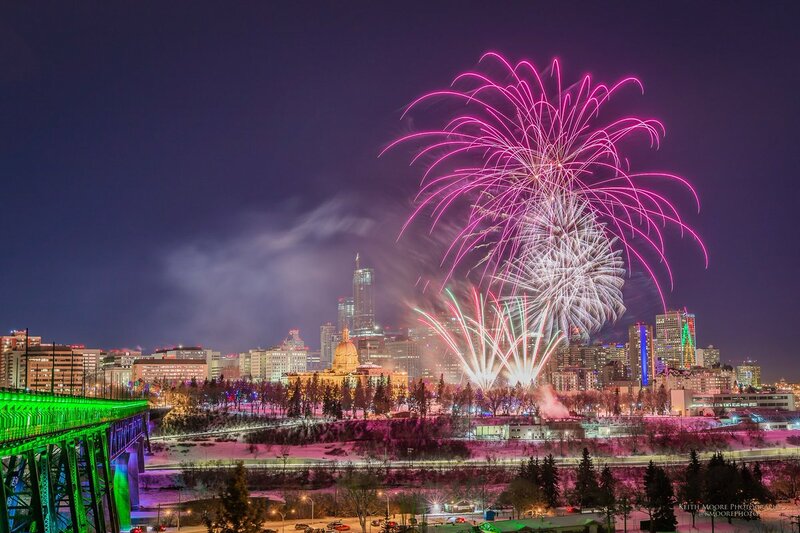 We're a major city in Canada that is missing out on national NYE exposure. Our NYE and Fireworks is a non entity beyond our borders. Nationally Vancouver, Victoria, Canmore, Calgary, Charlottetown, Niagara falls, Montreal, Toronto, Winnipeg all get exposure and some coverage as other locales often do on NYE. The CBC coverage nationally was specifically good. Edmontons has seldom even been on nationally even for a minute of coverage. We're a city that puts the least effort into NYE, does not hire a headline performer, and hopes anybody cares to even bother going to it or broadcasting it. The COE NYE celebrations are so abysmal, and always the same that it doesn't even matter if someone just watches the fireworks from a distance. Its the same experience. First night was a good production when we used to do that. People got into that and it was at least something to focus on. Now its basically always the same Fireworks, turn bridge lights on, burn some bannock. Round up some food trucks. Good nuff.. But I will say of the Nations festivities in a lot of regions did Canada proud. It was more entertaining and visually enticing than the US NYE telecasts. lol at CNN essentially doing complete coverage inside a sorry little pub. That had to be the weakest NYE coverage I've witnessed. On the plus side, our display was way better then Calgary's. I watched the livestream at midnight, and there's didn't have nearly as many big, high works, and was shorter, too. I wonder if LRT construction will be far enough along by the end of the year for the festivities to return to Churchill Square? Don't forget that IanO has objected to bars along 104 st due to noise as well. Seeing as there's residential near Churchill, I would imagine he'd have the same concern over their feelings as well regarding midnight fireworks. They want a "vibrant" downtown but none of the noise that goes along with it. They claim that "downtown is for everyone" but also claim it as their neighbourhood that everyone else has to respect as if it were a suburban neighbourhood. Here's to hoping that one of your resolutions for 2019 is to ride Ian's nuts less. We're all rooting for you! Sorry to disappoint you but I'll continue to challenge IanO (or anyone else) who has an opinion I disagree with.